Green for Harmony! Blue for Calm! Purple for Peace! Indigo for Life! These colors describe the peaceful Amish people and the colors in their quilts. Take time to relax, and renew yourself while making your own "Amish" quilt. Make fabric selection and cutting strips simple by choosing a Jelly Roll of 2 1/2" strips for 8" finished size blocks. Add one Background, traditionally black like the color of Amish clothing, and you are ready to go! 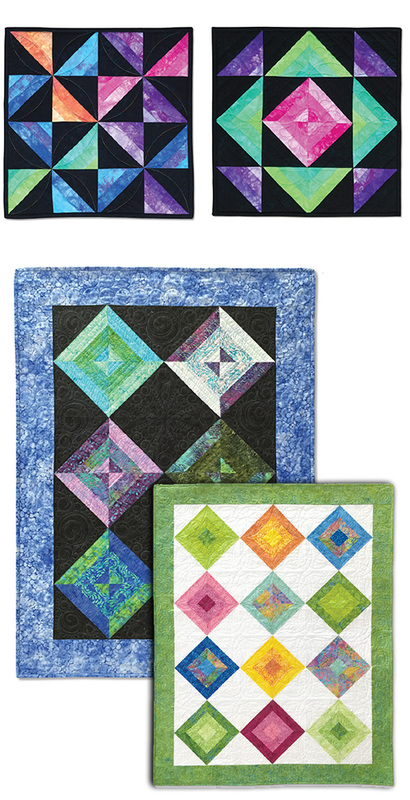 If you prefer little 4" blocks for a Wall Hanging, you will find everything in New Amish Quilts. Plus, save all your scraps for a charming Bonus Quilt!